Sometimes it is when something is gone that we miss it most. Such was the case with Tanqueray Malacca, which was met with a mixed response when it was first released, but achieved legendary status once it was discontinued, leading to its resurrection a few years back. 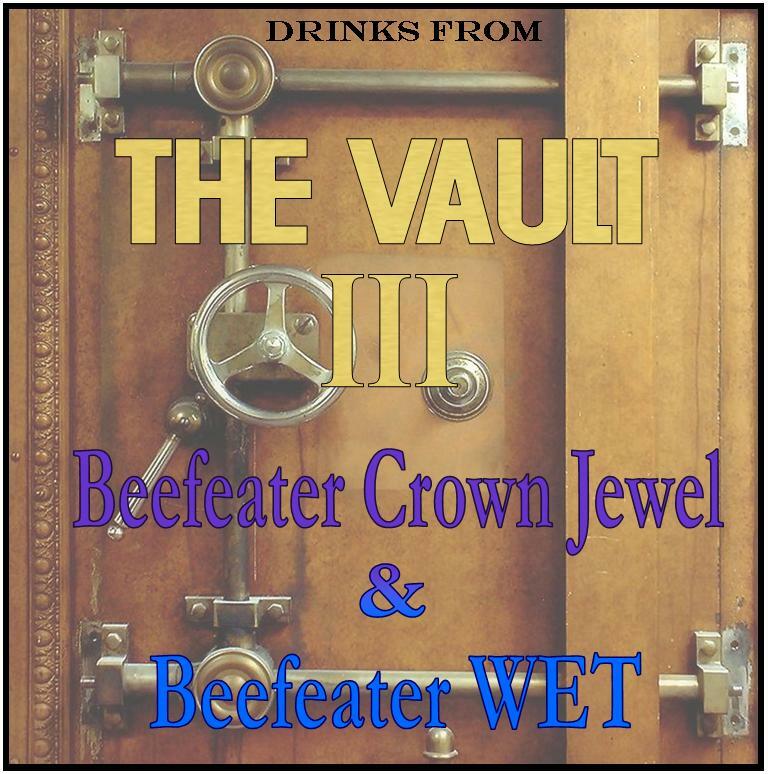 There is perhaps one other discontinued gin that has such cult status, especially amongst bartenders: Beefeater Crown Jewel. This gin was launched in 1993 for duty free/travel retail. 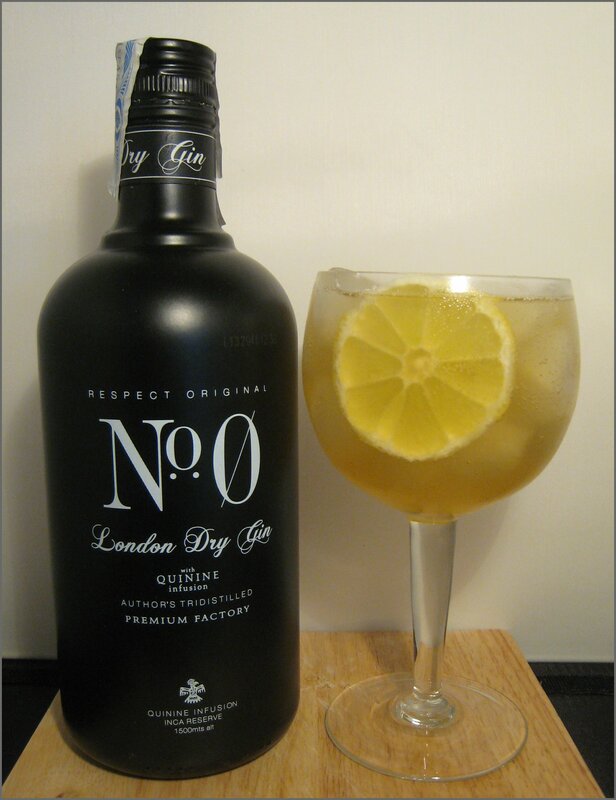 It was made using the classic nine Beefeater botanicals, plus grapefruit, and was bottled at 50% ABV. 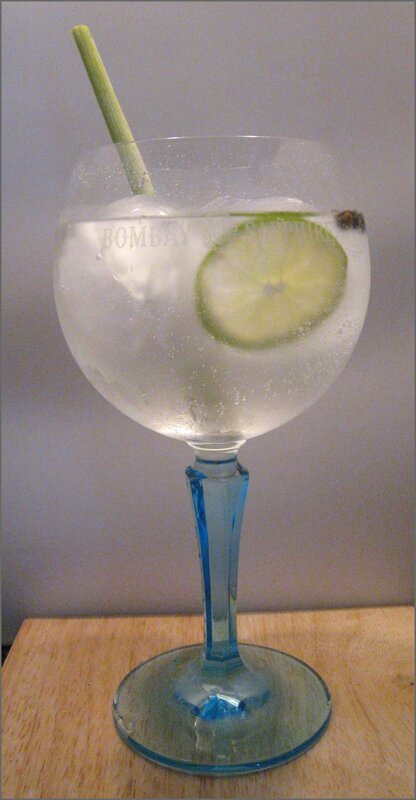 The original gin was discontinued in 2009, shortly before the release of Beefeater 24, which. in a nod to Crown Jewel, also has grapefruit in its botanical mix. Fast forward to 2015, and Beefeater Crown Jewel was re-released, available to the on-trade and at the Beefeater Visitor Centre. It is described as being an exact recreation of the original. Nose: Upfront, there is bright and zesty citrus: grapefruit and soft, tangy orange. Taste: Surprisingly soft for a 50% ABV spirit, this is creamy with soft citrus notes. The gin starts out refreshing before growing more balanced with notes of liquorice, coriander, and juniper. There’s a long, lingering finish with a light stalkiness and citrus zest. 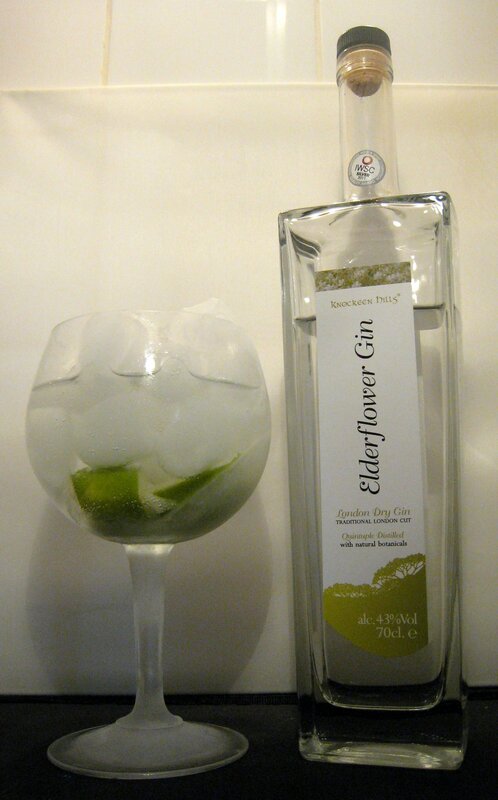 Intense, with a bold botanical flavour that easily stands up against the tonic. The bright citrus note of the grapefruit is a great addition. Sublime – soft and delicate, but with a confident, powerful flavour. Very smooth, silky, and sophisticated. The gin notes are more balanced and the citrus less prominent. Strong in terms of power and flavour intensity. This has a super-charged version of the normal citrus flair of Beefeater combined with the extra dose of grapefruit, which sings through and stands up extremely well to the Campari, making a punchy Negroni. It’s great to see this old favourite back. Smooth, but strong, the high ABV and bold, but balanced citrus notes make it a good choice for mixed drinks. I enjoyed it most in a Martini. 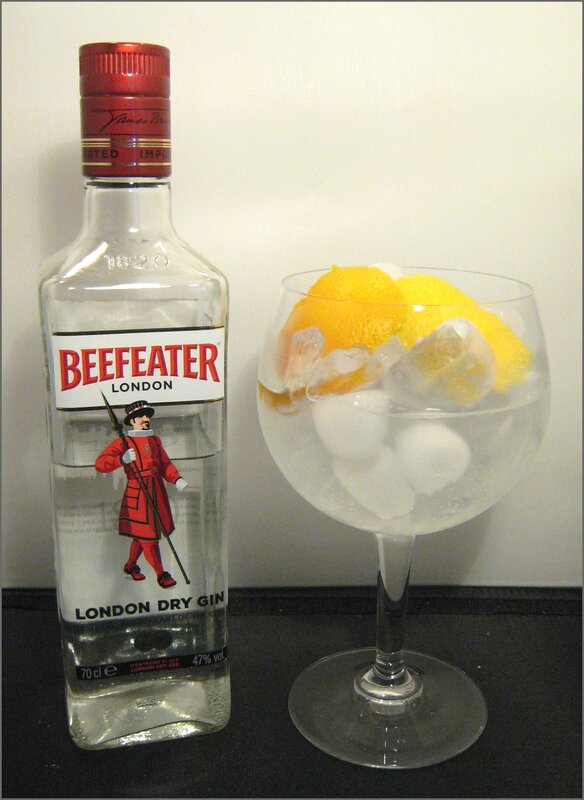 Today, we are looking at one of the stalwarts of the gin world; namely, Beefeater. 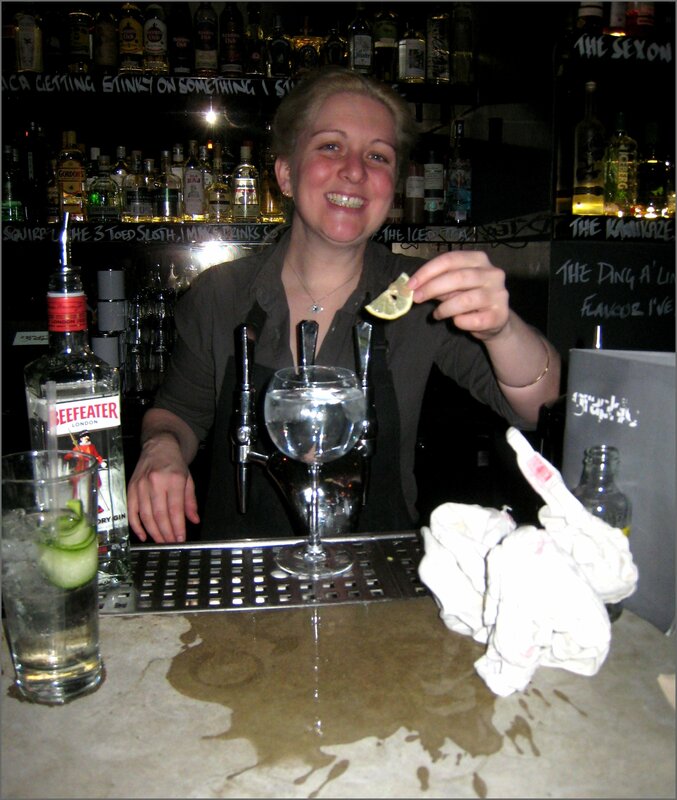 This is in part because the Beefeater 24 Global Bartender Competition Final is on Thursday 7th November 2013 and we are giving away 2 tickets to the final (see below). 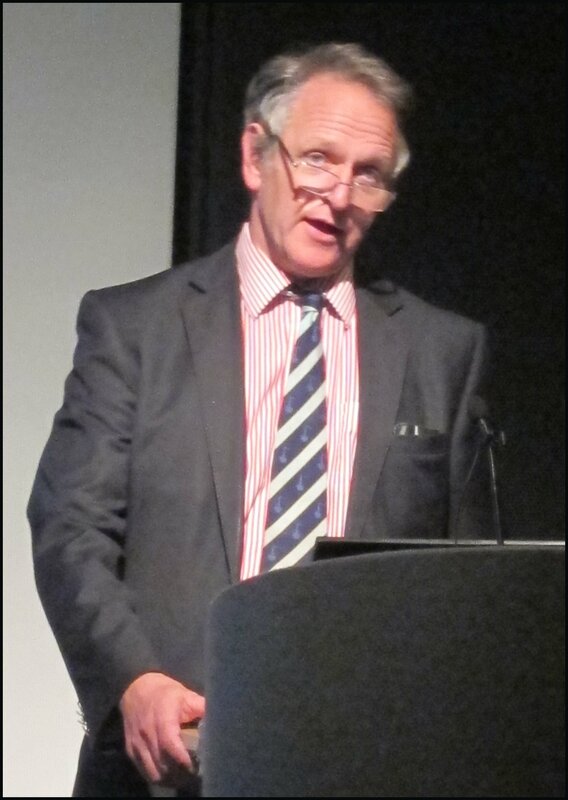 Beefeater was founded by James Burrough in 1876 in his distillery in London. 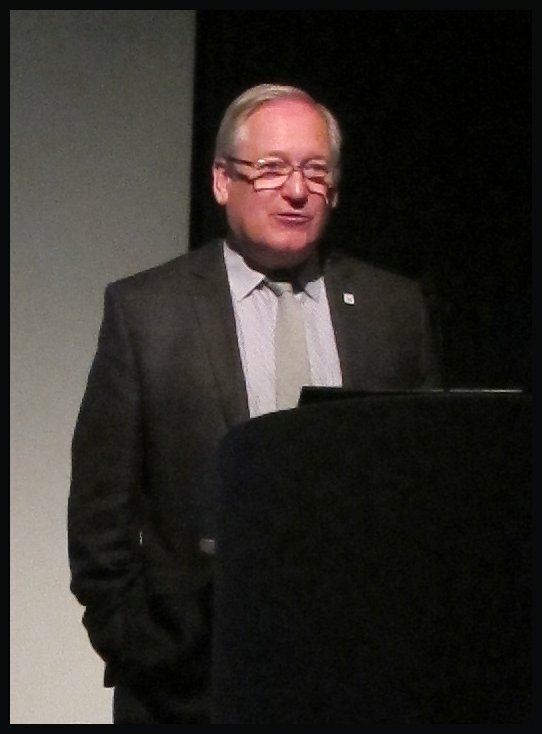 At that time, most gin brands were named after their founder, for example: Felix Booth, Charles Tanqueray, and Alexander Gordon, but James Burrough named his brand after something thoroughly reminiscent of London: the yeoman warder, the guards of the Crown Jewels of England in the Tower of London, the Beefeater. Today, Beefeater is made in Kennington and still contains the original botanical mix of nine ingredients as prescribed by James Burrough over a century ago. Here is a breakdown of the botanicals in both the original Beefeater and its variants. Nose: Coriander, lemon and orange, with some lemongrass at the end and just a hint of a malted milk biscuit. Taste: Smooth, with a creamy texture and a little sweetness. Orange flavours come through toward the end, with notable juniper on the finish. Classic and clean, with some sherberty citrus that works well with the bubbles of the tonic. Then there’s a good, dry finish. I’d recommend using either a lemon or orange garnish. A truly classic Martini, with the great mix of dry, slightly piney juniper, herbal angelica and then some crisp, slightly sweet citrus from the coriander and orange, both of which mix well with the herbal vermouth. A nice, mellow and accessible drink that’s quite sweet initially, but with a bitter finish and a hint of chocolate. A good garnish would be either orange or grapefruit. Very sippable; almost liqueur like. 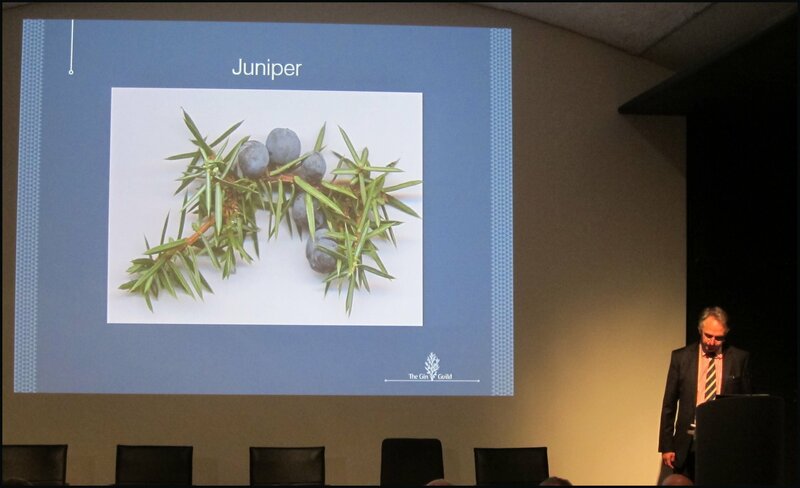 Nose: More of the juniper, angelica and other herbal and spice notes come through, with less citrus. Taste: Still a clean and smooth spirit, considering it is another 7%ABV in strength. The citrus is more forward at the start and the lemon is more balanced against the orange. 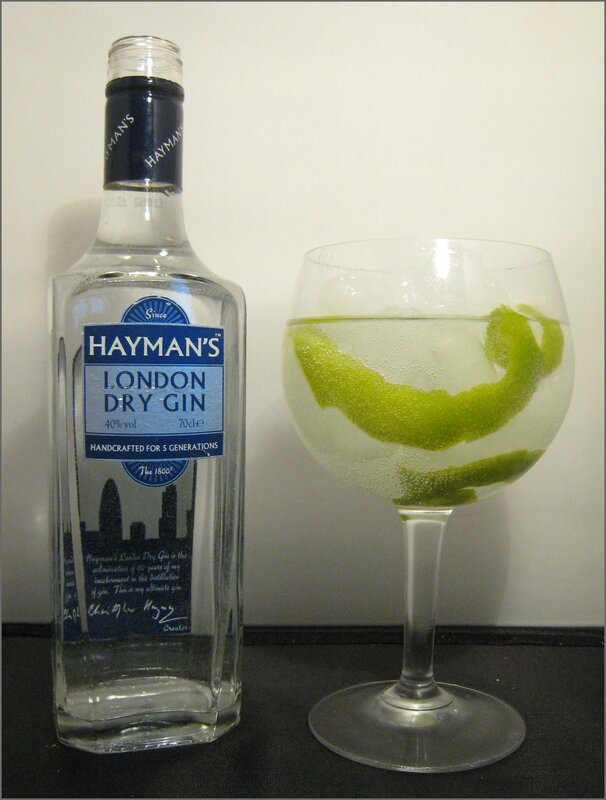 Altogether, this is a dryer gin, which is less sweet and more spicy, vibrant and intense. 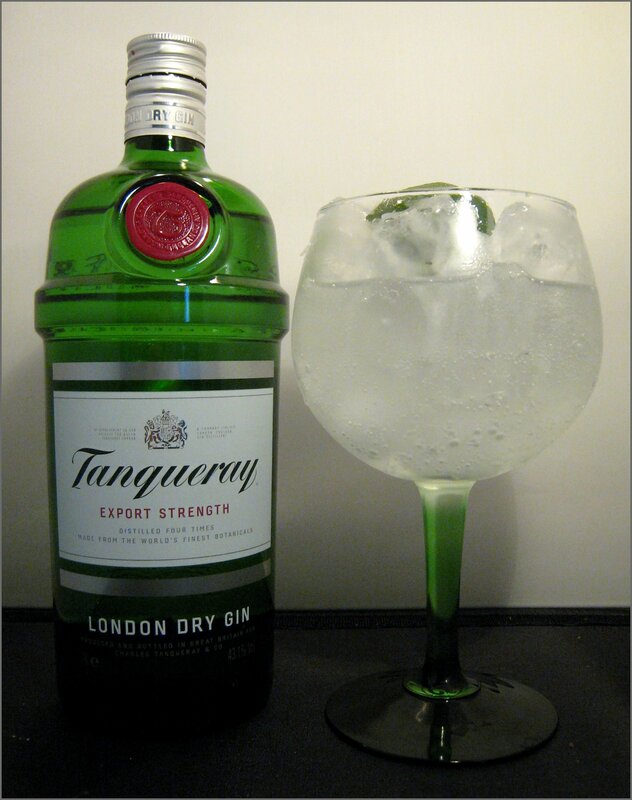 A dryer Gin & Tonic, this almost seems sharper and more streamlined. I really like it and my suggestion for a garnish would be lime, as the slightly sour notes work well with the crispness of the drink, whereas I think that the sweetness from lemon muddles the flavours a bit. A dryer and more intense Martini, with more juniper and more lemon, whilst the softer, sweeter elements are less pronounced. Although both drinks had the same volume of vermouth in them, this drink is far dryer. I can see why the 47% Beefeater is so popular for Martinis in the US and was the go-to brand throughout the ‘50s and ‘60s. Once again, this is a dryer drink with a richer, more herbal complexity and is a good example of a textbook Negroni. Quite excellent. WIN TICKETS TO THE BEEFEATER FINAL! Beefeater 24 is delighted to provide the winner of our competition with two tickets to the Beefeater 24 Global Bartender Competition Final in London, where eight finalists from the bartending community across 26 countries have been selected to compete and showcase their skills and creativity. Expect classic cocktails with a modern twist and the very best in mixology. To be in with a chance of winning, simply email david@summerfruitcup.com with the subject heading “Beefeater Comp”. The competition closes at 16:00 on Friday 1st November and the winner will be picked at random and notified shortly thereafter. T&Cs: Beefeater are offering a pair of tickets for two adults over 18 years old. Winners will need to make their own arrangements for transport/accommodation. Today, I have spent the majority of my day just south of Godalming at an airfield, judging the International Wine and Spirits Competition Gin Panel, where we judged 87 spirits in just over 4 hours. 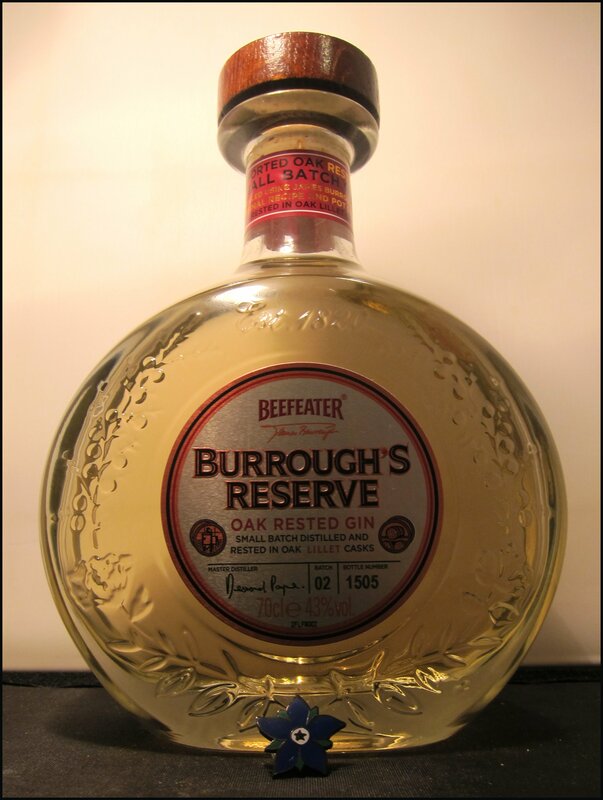 Today’s article, however, is about something rather interesting that I tried yesterday; namely, Beefeater’s Burrough’s Reserve. 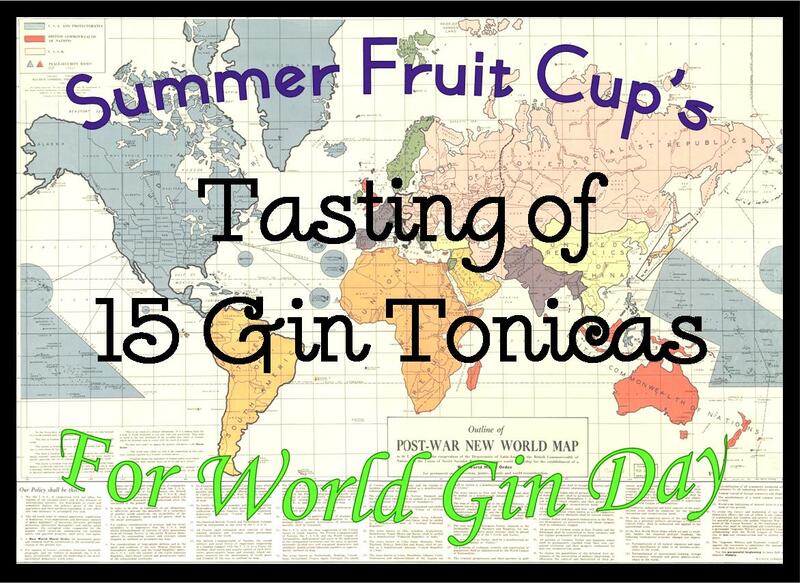 Now, you know that here at Summer Fruit Cup and at our US counterpart’s blog, The Gin Is In, we are big fans of yellow gin. Essentially, this is any gin that has had contact with wood to impact the flavour. Up until a few weeks ago, there were just over a dozen yellow gins available, with Citadelle and Hayman’s leading the charge in Europe and Seagram’s and a host of US craft distillers waving the flag for the good old US of A. 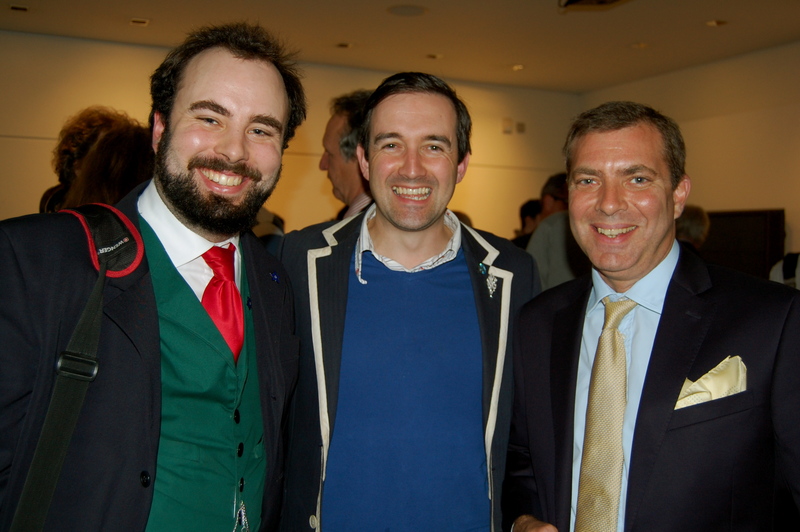 But, until now, no major UK distiller has ventured into aged gin. On the face of it, you may think, “Sure, Burrough’s Reserve is just aged Beefeater.”, but it goes a little deeper than that. The gin that is subsequently aged is made in still number 12, an original still from James Burrough’s Chelsea Distillery (Beefeater is currently made in Kennington). So, although the gin is made to the same recipe and with the same botanical mix as regular Beefeater, the fact that the still is a different style and much smaller than the modern stills, means that the resultant distillate is rather different. In essence, this spirit, before the aging process, is a close approximation of the spirit that the founder of Beefeater would have made in his Chelsea Distillery. 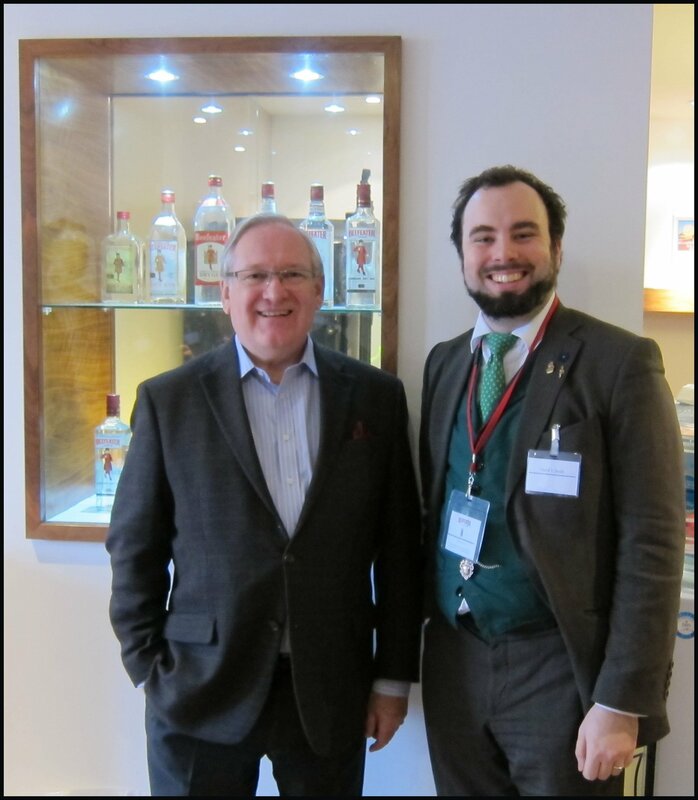 Not content with this trip down memory lane, Beefeater, led by their (not yet knighted) Master Distiller Desmond Payne, decided to age it in Jean de Lillet casks. Jean de Lillet is a high-end, rarer version of the classic Lillet Blanc. The gin is generally aged for around 3 months, but, in reality, it is a case of when it’s ready, it is ready. 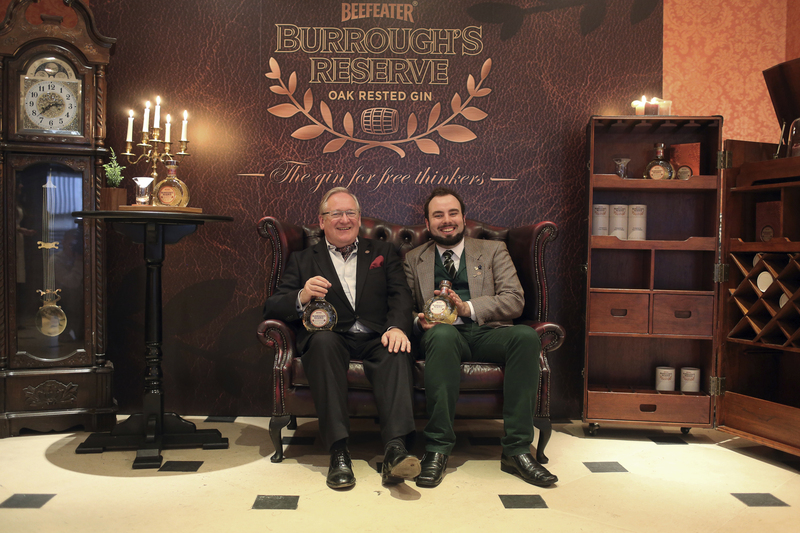 Burrough’s Reserve is retailing at around £70 a bottle and, as such, Beefeater recommend that it is not used for mixed drinks. 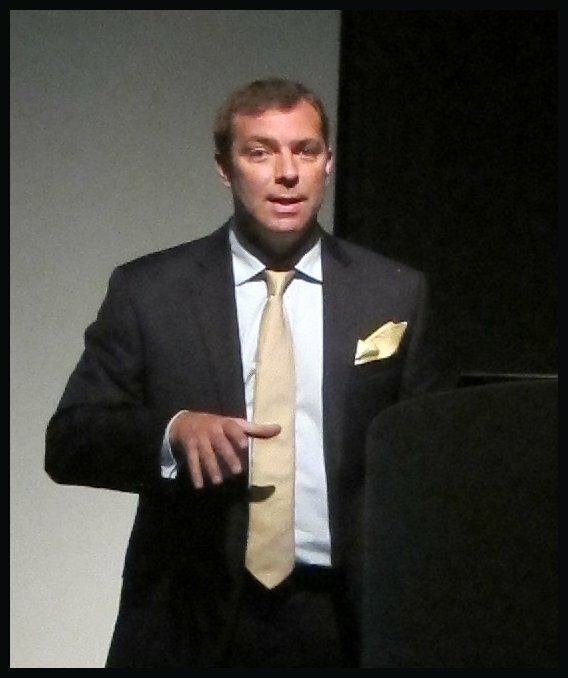 I understand this to an extent, given the complexity of the product, but, as a result, I was surprised to discover that Beefeater had enlisted the help of world renowned mixologist, Tony Conigliaro, for their launch. It turned out, however, that they didn’t want Tony to mix with the spirit, but to design the right glassware to go with it. For the global launch, we were able to try out the specially designed Conigliaro glassware, which consisted of a non-stemmed tasting glass, upon which sits a stemless martini glass. 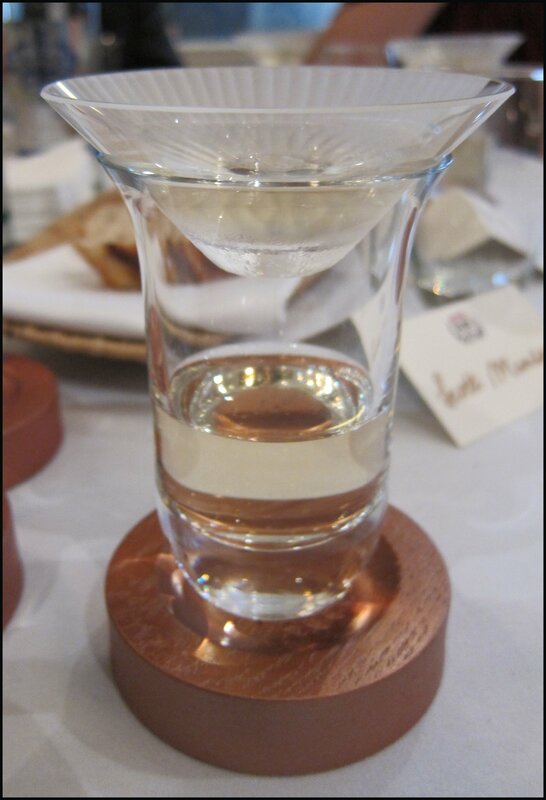 The idea behind this is that, depending upon the width of the glass, the amount of evaporation and, hence, the aromas that are given off changes. Tony wanted to illustrate this. He also spoke to us about serving the gin at different temperatures, which I’ve incorporated into my tasting notes below. Nose: Juniper, orange, dark caramel and woody spice. Taste: Soft texture, with plenty of vanilla, cinnamon, and nutmeg up front. Whilst quite sweet to start, this moves on to a dryer, slightly tannin-like flavour, then the classic juniper and angelica gin flavours with a little citrus, before finishing with some vanilla oaky notes. Nose: The notes of the wood are more pronounced at this temperature; some floral notes, like grape flower, orange blossom and camomile come through, as well as a resin-y juniper. 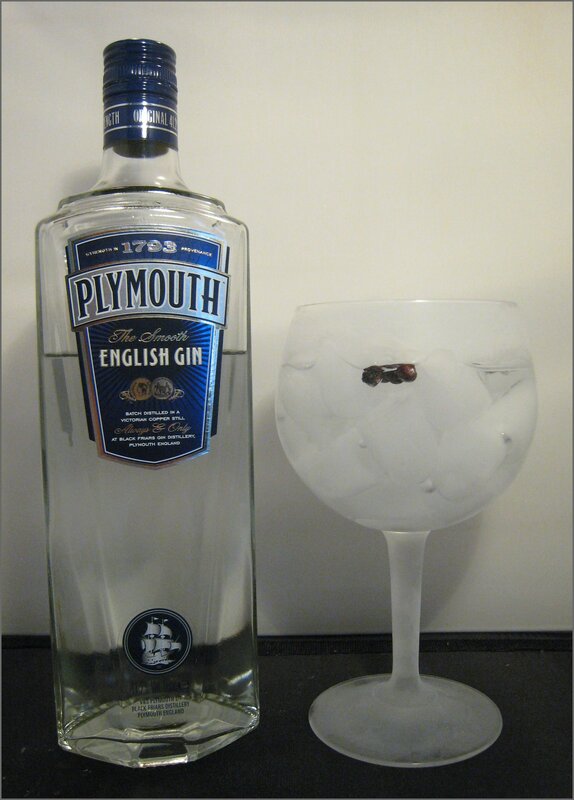 Taste: The lower temperature starts to increase the viscosity of the gin, which gives it a thicker texture. The flavours are still strong, but some of the citrus and floral elements are more dominant, such as orange peel and orange blossom. There’s also a little creamy toffee up front and a dry finish. Nose: The strength of the nose is reduced when it’s this cold, but the citrus still manages to come through, accompanied by a dry spiciness. Taste: This has an excellent, thick, rich and smooth – almost velvety – texture, which really adds depth and character to the spirit. There’s juniper to start, followed by some vanilla, spice and hints of Simnel cake, then a very long, lingering and incredibly dry finish that stays for well over a minute. It seems clear that aged/rested/matured/yellow gins are here to stay; once one of the big bosses moves towards a trend, you know that it has legs. I liked the balance of Burrough’s Reserve and it certainly highlights Beefeater’s underlying botanicals and the impact of the Jean de Lillet wood. It’s a sipping gin and that’s reflected in its £70 price tag, which, by my estimate, makes it the third most expensive gin in the world*. * After Nolet’s Reserve ($700) and Adler’s Reserve (500 Euros). Burrough’s Reserve is available from The Whisky Exchange for around £63 for 70cl. 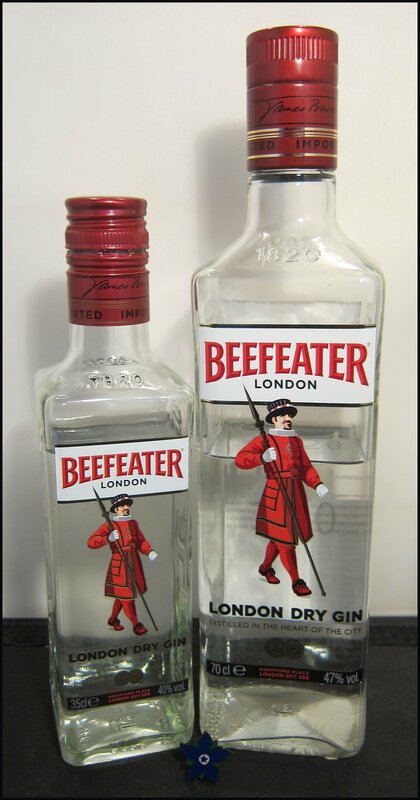 I recently came into the possession of two bottles discontinued of Beefeater Gin. The first was Beefeater Crown Jewel, this gin was launched in 1993 for the Duty Free market, although some specialist shops in the UK occasionally sold it. 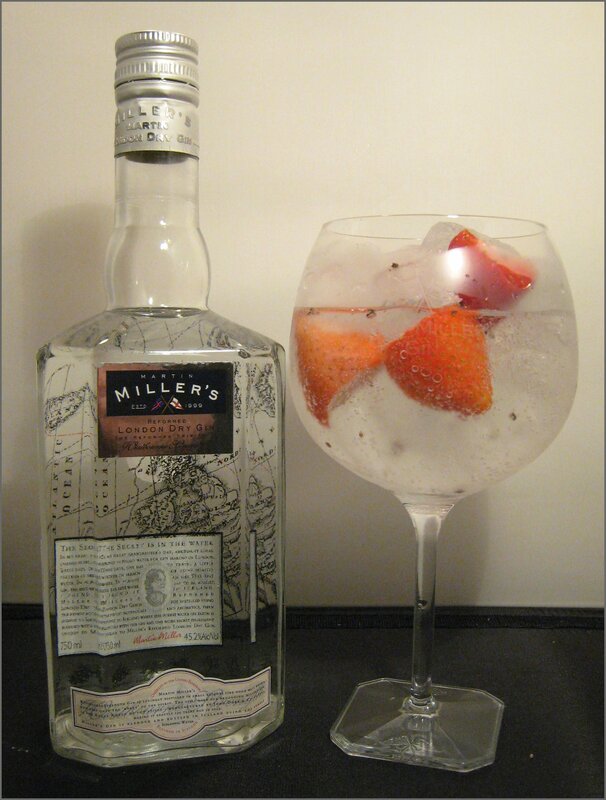 It was based on Beefeater’s standard mix of 9 botanicals, plus grapefruit. Additionally, it was bottled at 50% ABV. With introduction of Beefeater 24 in 2009, Beefeater Crown Jewel was discontinued. 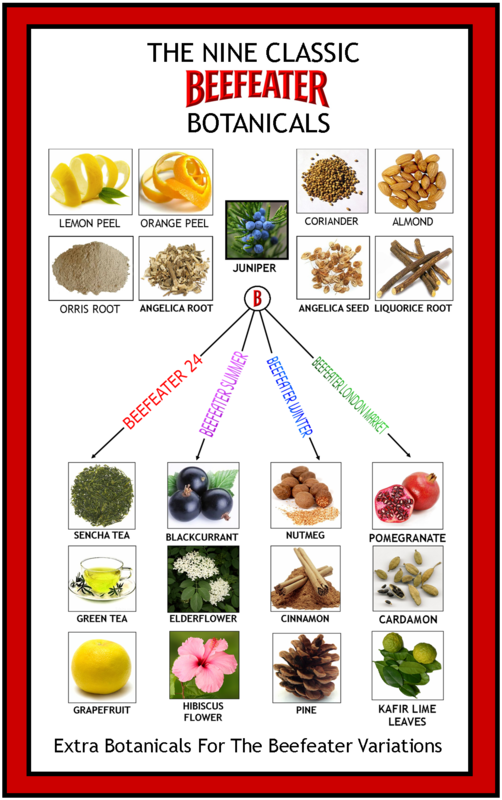 It is worth noting that Beefeater 24 still contains grapefruit as an additional botanical, as well as two types of tea. Nose: Pine, initially, then some savoury notes, a hint of orange and some other zesty citrus. Taste: Powerful in flavour and alcoholic strength, this is pretty classic start, but, in addition to its sheer intensity, the main difference between this and original Beefeater is the long finish of grapefruit; this is a simple variation, but a great one and one that should add a new dimension to cocktails. Very thick and viscous; very smooth, but the flavours remain intense: juniper, citrus, angelica, coriander and then a zesty finish with some marmalade sweetness. Very, very pleasant to sip. This has a zesty nose and is very dry, indeed. It’s refreshing, with plenty of citrus and the grapefruit coming through at the very end. I quite like it; served ice-cold, it is rather delightful. Very intense and exceptionally cold; simply, excellent. It has a marvellous, sweet and citrusy finish. This is one of the best Martinis out there and I’m surprised that I have only just discovered it. Brilliant. An exceedingly intense Negroni; for some, this will be absolute bliss. The extra citrus from the grapefruit comes through the drink like a knife and gives you a pow in the kisser. The hard-core Negroni fan will love this, as it turns the bitter-sweet balance and intensity up to 11. Superb. Beefeater Crown Jewel was made using only a small variation on the original Beefeater botanical mix, but it was a welcome feature of duty free for many years and a bartenders’ favourite. 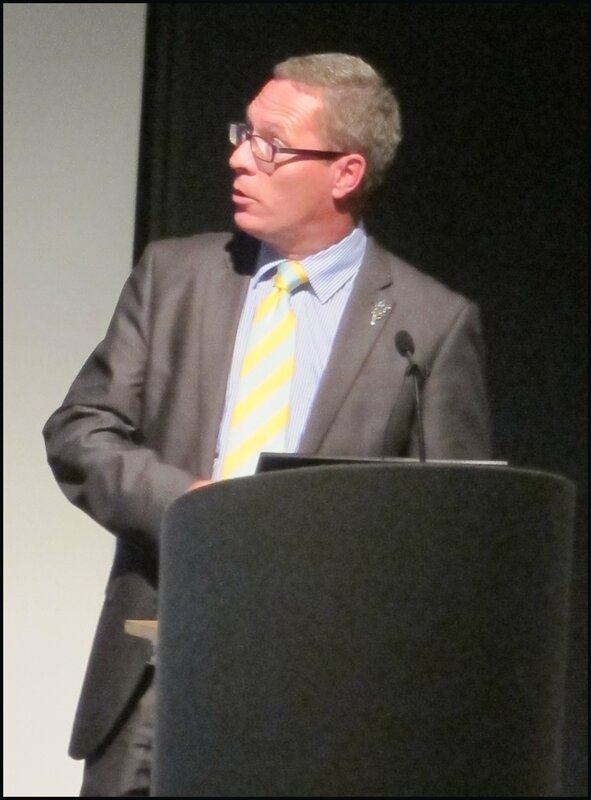 Now discontinued – and I have it on good authority that it won’t come back – it’s over; time to move on. Sad, but we’ll always have the memories. Beefeater Wet, released in 1999 (and discontinued 2005), was designed to be a different style of gin – slightly sweeter and more fruity – than Classic Beefeater and, along with Tanqueray Mallaca (1997), they laid the groundwork for the new way of thinking about gin that eventually led to the rise of Contemporary-style gin. 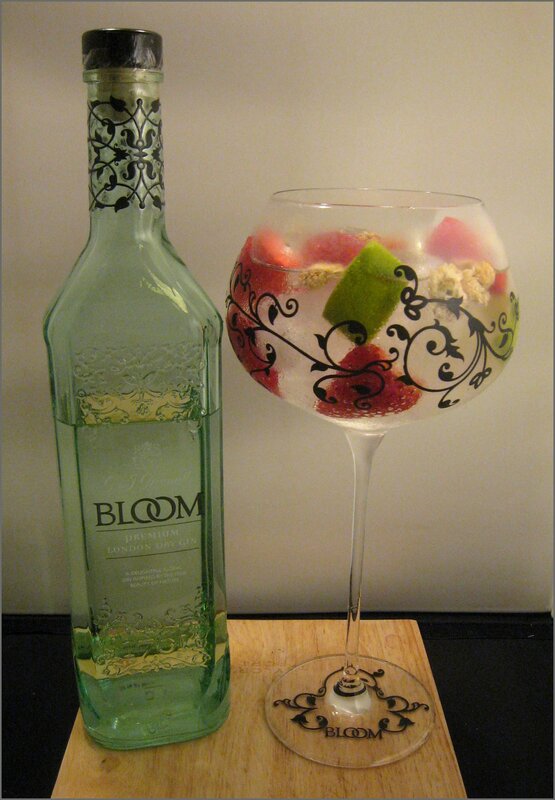 Interestingly, both of these gins were marketed in the US and, today, this is where this style of gin is most popular. Beefeater Wet departed from the classic recipe with the addition of extra spice, pear essence and a little sugar. It is also bottled at 37.5%ABV, rather than the usual 40%ABV for the UK or 47%ABV for the USA. Nose: Juniper upfront, and then some earthy notes that are followed by notes of freshly cut pear, with just a hint of oxidation. Unusual, but inviting. Taste: Quite smooth and sweet, with the pear coming through again. 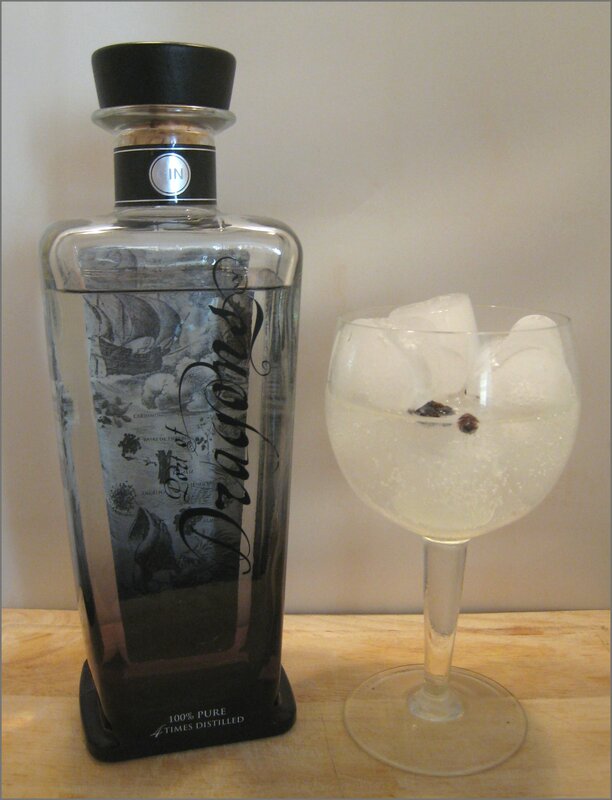 This is particularly unusual and, given when it was released, I can see how it can be considered as one of the gins that paved the way to the wave of New Western or Contemporary style of gins. With a little water, more coriander comes through and makes the drink fresher and the pear even more prominent with a final, soft, creamy citrus flavour. Sweet and silky, silky smooth. There are hints of marzipan and pear, as well as some vanilla creaminess and a finish of piney juniper. Pretty good and rather liqueur-like. Beefeater Wet was created for the US market, where Gin & Tonics take a backseat to other gin drinks, and, as such, this doesn’t work that well. I used Schweppes EU, which is typically more generous to a gin than the UK version or the even sweeter US variety, and it still pretty much overpowered the gin, even at a 2:1 ratio. The gin comes through more on the finish with notes of pear drops and marzipan. That said, after a little ice melt it does become more refreshing (as long as you like the taste of tonic). Good, but, even with my standard amount of vermouth, it is a rather wet Martini with a fair bit of sweetness and the flavour of fruity, spiced pear. This is very different, and not at all classic in style, but it will appeal to some. Beefeater Wet makes quite a sweet Negroni, but one that is particularly smooth. The fruity pear comes through on the finish, especially. Whilst this isn’t as intense or powerful flavour-wise as many Negroni fans would like, it is, by no means, a bad drink. I had tried Beefeater Wet before (in 2007) and, to the best of my recollection, it was “not that great”. Five years on, my palette has developed and I thought I’d give it another go. I was surprised at how much of the pear came through and that the flavour seemed pretty genuine. 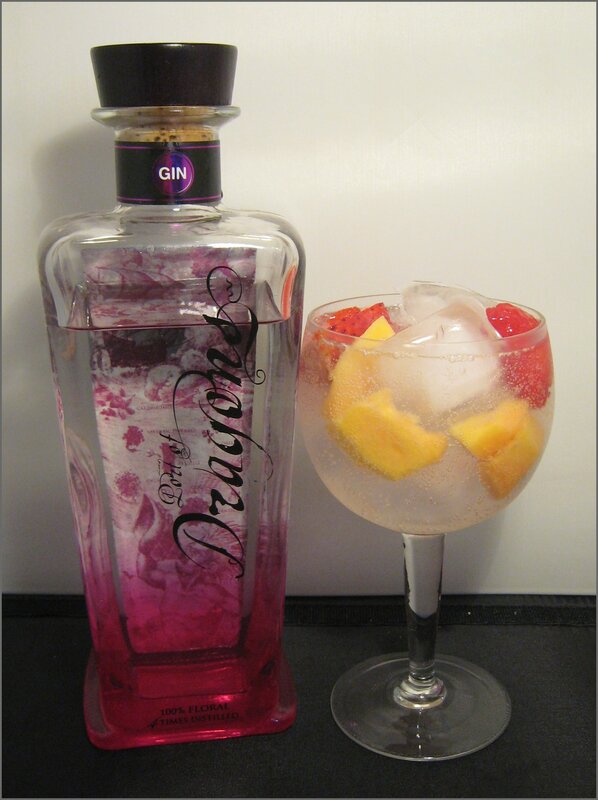 The gin is smooth, but you would expect that, given the lower %ABV and slight sweetening. 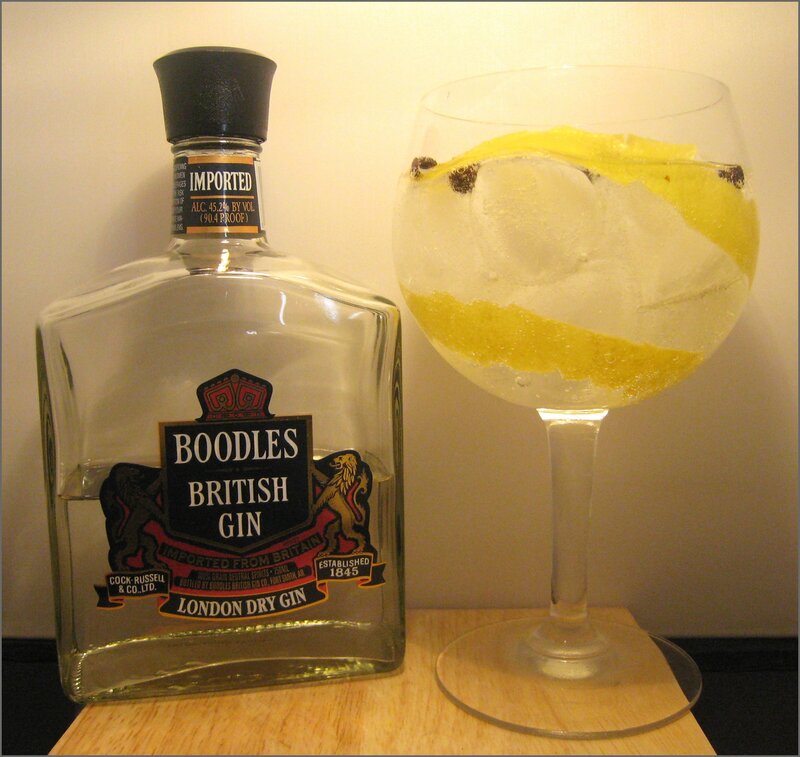 Its freshness makes it great for long mixed drinks such as the Gin Collins. 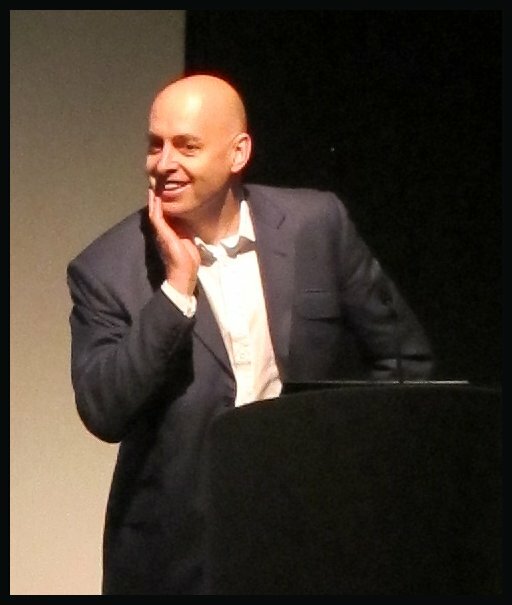 I think that if this gin was released today, then it would enjoy a lot more success than it did, as palates have changed or, more precisely, a whole new generation of gin drinkers with different tastes have “joined the party” and with them comes a demand for the more contemporary products. 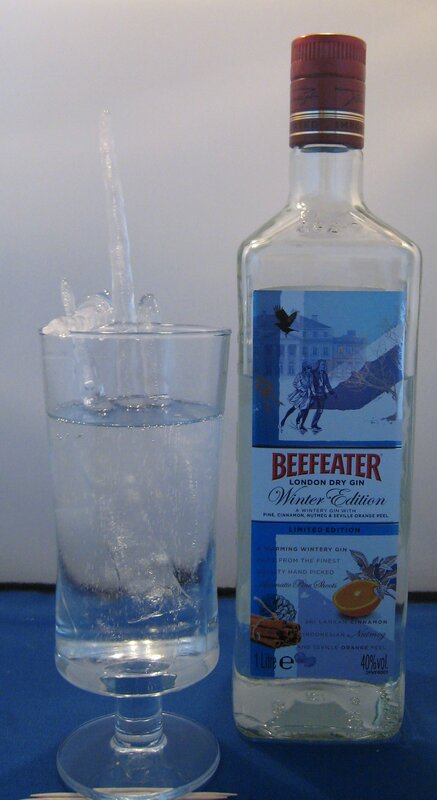 My favourite way of drinking the Beefeater Wet was either straight from the freezer or in a Gin & Tonic. It seems that Beefeater have excelled themselves in gin innovation this year by launching not just one, but two seasonal varieties of their gin. 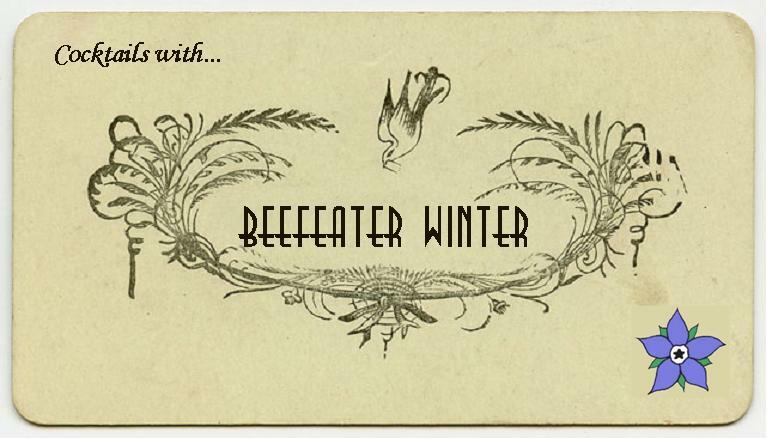 Beefeater Winter follows their summer edition and, in addition to Beefeater’s normal botanicals, takes flavour from pine shoots, cinnamon and nutmeg. Given the very festive nature of this gin and Mrs. B’s new fondness for hot cocktails, in a new twist for “Cocktails with…”, one half of the drinks we tried were hot. We tried this in an icicle Gin & Tonic, using real icicles from a recent cold snap. I really enjoyed this drink, as I do normally with Beefeater, but it was only at the end that I could tell the two apart: Beefeater Winter has a much spicier nose. A good Martini; the extra botanicals in Beefeater Winter complement the vermouth well and, although the drink itself was stirred until ice cold, it seemed more warming than your average Gin & It. A subtle and smooth Gimlet; the gin balances out the lime cordial and is quiet until the end, when the winter spice comes through, followed by a little juniper bitterness. Beefeater Winter produced a beautifully smooth White Lady, and, as with some of the other cocktails we tried, the difference between normal Beefeater is noticeable at the finish of the cocktail. A crisp Aviation. Although it is quite nice, I preferred most of the other drinks. The Bramble rather overpowers Beefeater Winter, with the Creme de Mure making it too sweet; the ingredients don’t seem to blend well. The cranberry and mint are well matched and the nature of the gin means that the flavour comes through without overpowering the drink. This hot and fruity cocktail is a nice alternative to most hot toddies and nogs, as it’s neither creamy nor based on honey. This smelt liked apple sauce and reminds me of home-made stewed apples. The warmth of the gin comes through, with a little spice and some apple freshness; it’s a good alternative to the standard hot gin toddy. Mrs B. says it reminded her of a hot apple pie. A hot version of the Original Gin Alexander, this was a punt, but I was pleased with how it worked out. 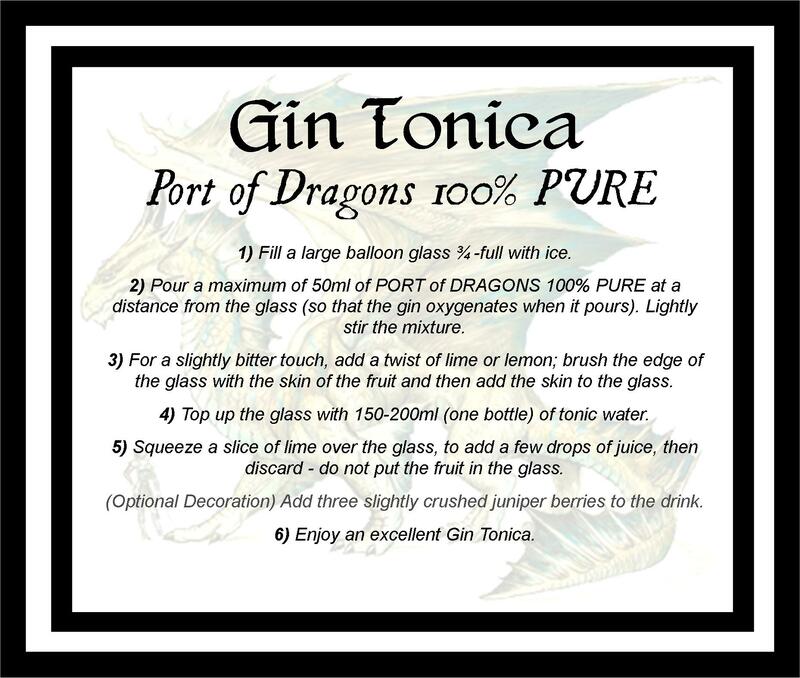 The standard drink is usually served ice cold and so isn’t so great for the winter, but the hot version has a delicious creaminess and provides a good appreciation of the gin and its wintery notes. This was a hot variation of the recipe provided by Beefeater. It tasted a little like cake batter, with a flavour of the gin at the end. 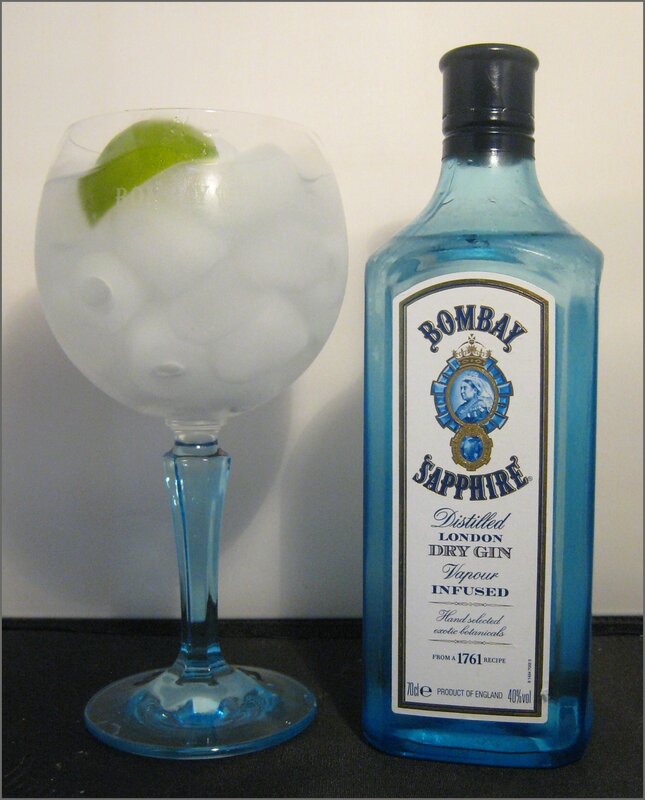 The gin works well, as it is not too overpowering, but provides some spice. The drink tastes a bit like custard, but, when you consider the ingredients, that’s not too surprising. I think the garnish of cloves add something to the flavour and complements the Beefeater Winter well. This gin makes a very classic gin toddy. Tastes like a Christmas Bakewell tart: a little milky, with sweet almond notes, all finished off with a cherry garnish. Some juniper and spice at the end. Hot buttered rum, Beefeater style. This was incredibly indulgent and probably should take the place of a pudding. It tastes of caramel and butter, reminding me a tad of raw flapjack mix. Drinking it through a top of layer of whipped cream adds to the sweetness and the coolness of the cream contrasts nicely with the warmth of the drink. I used molasses sugar, which seemed to work better with the flavours of this particular gin. 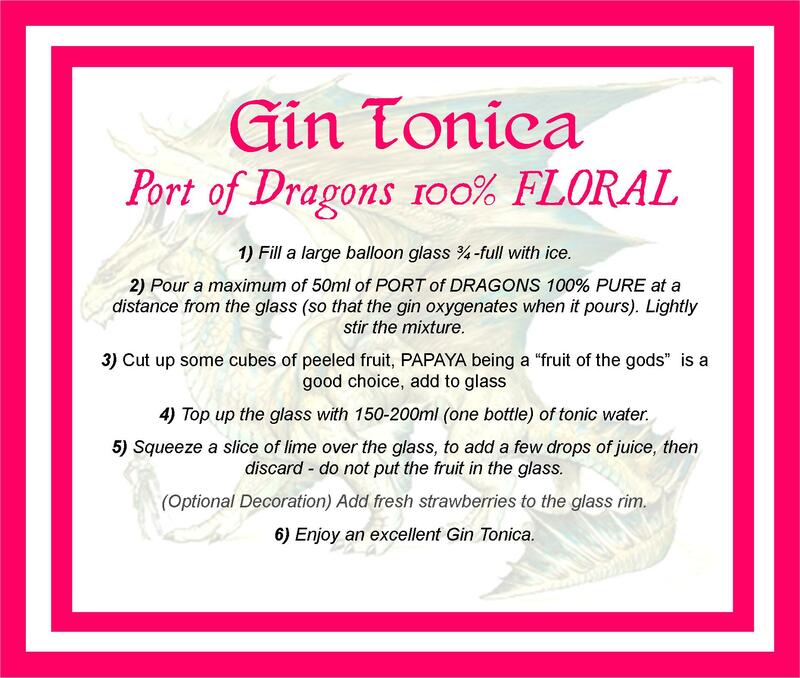 In conclusion, I think this is another great innovation and, although I think it works well in some of the cold drinks, it really shines in the hotties; with a bit of innovation and seasonal flair, you can find some perfect winter warmers to make with this gin. After this review, it begs one question: in the future will there be other seasonal variants of Beefeater? 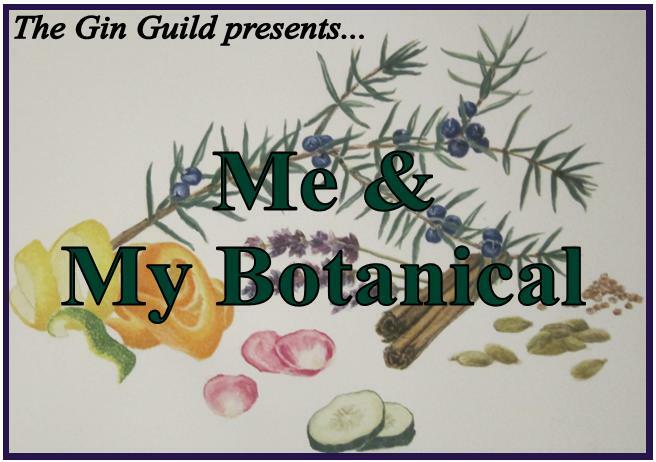 Perhaps a spring or autumnal gin? Time will tell, but I for one would like to see them! Available for around £18-£20 for 70cl from The DrinkShop & The Whisky Exchange. CONGRATULATIONS! You’ve found an Easter Egg on SummerFruitCup.